It’s a big week. In addition to launching my hand-dyed yarns – I also just released the “Hespeler” cardigan pattern. The yarn is a beautiful linen/alpaca/silk hand-dyed by a very talented local dyer, Yarn Indulgences. You can buy this yarn from her website, from her many trunk shows at yarn stores around Ontario, or from the annual yarn festivals such as KW Knitter’s fair. It really is the yarn that makes the sweater. The beautiful sheen and drape from the linen/silk, is uniquely complemented by the softness of the Alpaca. A perfect light summer sweater. It’s a DK weight yarn, but the pattern calls for a loose gauge on large needles (19 sts/4″ on 4.5mm needles) in order to achieve that light lacey fabric. It is cast on from the centre-back (provisional cast-on) and the yoke is worked first. 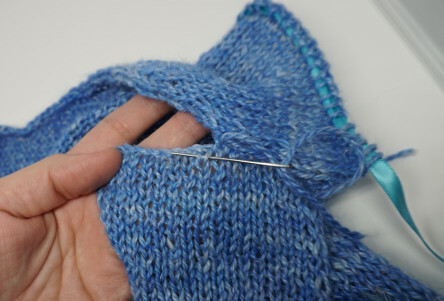 The body and sleeves are then picked up from the yoke and knit down. 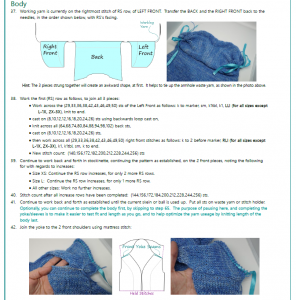 Since you are knitting top-down, you can ration the wool and use up every last precious scrap of your “Indulgent Love DK”, making the sweater as long or as short as you like. 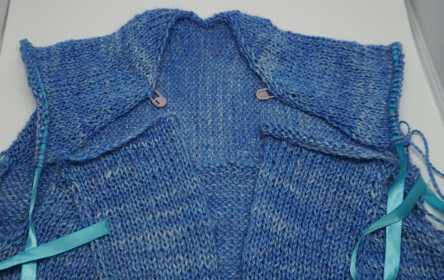 Next to the yarn, my favourite parts of this sweater are the details in the construction. The lines in the yoke, along with the slipped stitch border down the front make the sweater hang just right, despite its generous ease. There’s eyelet detail along the cuffs and bottom edge, along with a slightly rolled edge. Hope you enjoy the pattern. As usual there is a wealth of visual instructions to help, inside the pattern.